This fume hood is specially designed for safe and convient handling for radio active materials. The design is identical to other hood types in nearly all other aspects, except the interior and work surface. We designed radioactive fume hood with taking great care and considering two very special aspects. 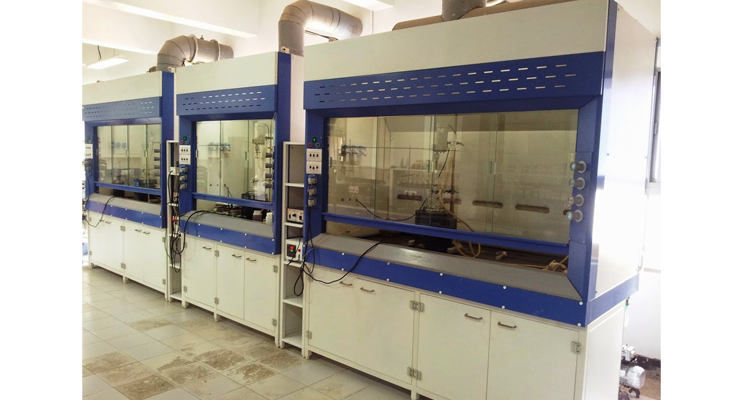 Firstly the interior of the fume hood is constructed such that even minute portion of radio active material can be easily cleaned from the surface. Secondly Reinforced work surface is stroang enough to hold the heavy load brick that are used to shild radio active material during work. TO ensure the radio isotops are properly purged , the internal worksurface & interior of the fume hood are welded seamless construction with all coved corner which is to prevent absorption of radioactive materials. The interior of fume hood and integral counter top are fabricated of 304 stainless Steel , Buffed and polished toa smooth finish . This reduce the chances of chemical built up and simplifies decontamination.For easy cleaning we provide removable Baffel sysytem in SS 304. Our designed is based on Industy Demands , the Highest Quality Material and Latest Technology. We can also make Fumehoods as per your suitable requirements. SS 304 Removable baffel sysytem for easy cleaning. SS304 airfoil for better resistance to corosion .